When 1.4 launched, Renown Tactics were removed from the game. The slots remained in the UI and now we know why. During yesterdays Hot Fix, a few new renown tactics were added to the game. There was also a change to an important renown ability. Read on for the details. Hardy Concession: This Renown Ability will now reduce outgoing healing. Before, this renown ability (passive) reduced incoming damage but also reduced outgoing damage. This lead it to be very attractive for healers, since they take less damage without any downside. With this fix, outgoing heals are reduced as well. New Renown Tactics are now available at Renown Ranks 90 and 100. These new Renown Tactics may be purchased through your Career Trainer in the Career Abilities Window upon reaching Renown Ranks 90 and 100. This was a rather unexpected (but welcome) addition. Although, the new tactics are not very interesting. 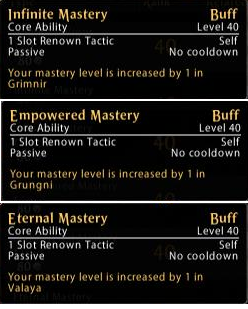 One just gives + wounds and the other just give +1 to a particular mastery tree. This is a passive point, not one you can assign. They each cost 80 silver, no renown points are needed to purchase and equip. Hopefully they will be adding some more as time goes on.